Emma McDonough's on a mission at the Junior Achievement’s Inspire event to talk to as many professionals in the criminal justice field as possible. After all, the eighth grader from Maryvale Middle School already knows what she wants to be when she grows up. “I want to be a lawyer and help people who are going through tough times,” she said. McDonough was one of close to 600 students at the event held at the Buffalo Niagara Convention Center. The goal of the event was to engage students and encourage professional goals at a young age. 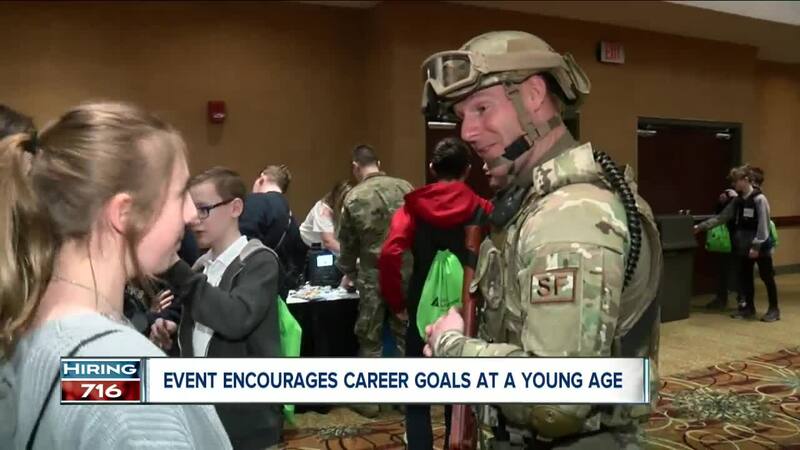 “It's important for students to understand why what they're learning is going to be important into their career,” Junior Achievement of WNY President Laurie Mahoney said. Students from as far as Byron Bergen Central School District are learning the skills and soft skills needed to get that dream job. They're also able to make connections and ask questions from business representatives across western New York. This is only the second year Junior Achievement has hosted an event of this kind. But, it's already grown tremendously. Last year, it had seven companies participate. This year, there's 40. “Students have a lot of opportunity to meet with various business. It's very diverse,” Mahoney said.